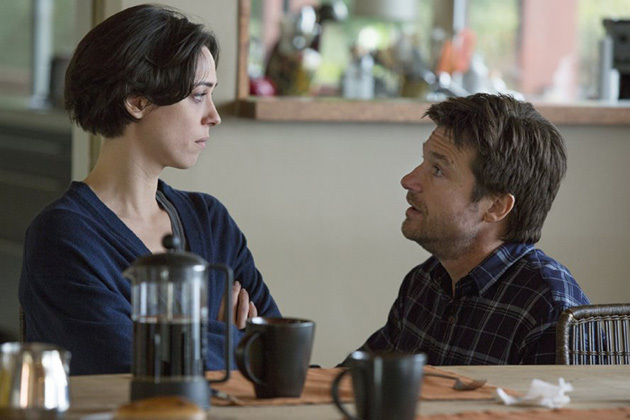 Joel Edgerton’s debut feature The Gift (2015) is good. Actually, it’s really good. Really really good. This might be one of the finest first efforts of an actor turned writer/director since Ben Affleck’s Gone Baby Gone (2007). Edgerton has made a tense psychological drama that makes us think it plays out one way, and then delves into much nastier territory than we could have imagined. But it’s so well put together, so expertly paced with pitch perfect tone and style that I was on the edge of my seat the entire way through. Edgerton constructs his narrative like a seasoned veteran. It’s a remarkably impressive debut for a person who has already gained respect performing in front of the camera. Because it relies heavily on the element of surprise, I’ll try to keep specifics down to a minimum. Let’s start with the basics. Simon (Jason Bateman) and Robyn (Rebecca Hall) are an upper class couple moving into a new home not too far from Simon’s old neighborhood. One day while shopping, they run into Gordo (Joel Edgerton) a childhood acquaintance of Simon’s from back in grade school. After a few pleasantries and polite conversation, Simon and Robyn nonchalantly suggest they should have dinner sometime. Gordo – as it were – takes them up on the offer. Although Gordo appears to be a little socially awkward, both Simon and Robyn try to give him a chance. That chance, unfortunately, leads all three down a very dark pathway. And that’s all I’m going to say about the plot. On the surface, this looks like one of your typical late 80’s/early 90’s thrillers where a well to do family is infiltrated by some nefarious force, ala Fatal Attraction (1987) or The Hand That Rocks the Cradle (1992). But Edgerton’s script has other things planned. He works inside the mind of the characters – especially with Simon and Robyn – and uses the appearance of Gordo to reveal aspects of all three that is disturbing but downright captivating. For a first time filmmaker, I was struck by how patient Edgerton is. He casually lets the story unfold; slowly pulling away layers until he reveals the complete picture. Not often do I find myself wondering where a film is going and how it will end. But here I was riveted to see how everything will resolve, and even hours later I was still pondering the themes Edgerton explored. One of the biggest themes is that of human thought. It’s very easy for people to have a certain view of a subject, and allow that perspective to dictate their very livelihood. What we’re told and how easily we accept those ideas shapes our actions not just as individuals, but toward our treatment of other people as well. The dynamic between Simon, Robyn, and Gordo is defined by this very theme. It’s difficult to explain without revealing major spoilers. Just know that Edgerton’s handling of this material – how an idea can turn into a solid belief structure – is so finely tuned with philosophical aptitude that it borders on existentialism. Stylistically, Edgerton never hurries. This is especially evident in the first two acts. His camera often remains still, or moves gradually to provide information. Colors are washed out, and the use of shadows is abundant. Credit should go to his cinematographer, Eduard Grau, in helping create such strong atmosphere. This maybe classified as a mystery/thriller, but it tiptoes the line of horror as well. On at least two occasions, Edgerton hits us with massive jump scares that don’t feel cheap, because he spends an ample amount of time developing the mood and creating significant tension. Sometimes it feels like he amplifies the mystery out of thin air. The acting is a standout from all involved. Edgerton does a good job playing Gordo as a strange creature. We can never put our finger on him, always guessing what his intentions are right up to the end. Rebecca Hall provides solid work as Robyn. Much of the middle portion is seen through her eyes, and she makes us believe the paranoia quickly developing in her character can reach a breaking point. But it’s Jason Bateman’s performance as Simon that comes as the true surprise. Bateman would not be the kind of actor I would associate with this genre, but his skill set fits right in to what Edgerton is trying to do. Bateman’s well-known sardonic (sometimes condescending) delivery has helped him in comedic roles, but here it molds Simon as a career obsessed alpha male. The chemistry between all three operates against the grain, as we wouldn’t normally expect all three to exist in the same room. But Edgerton capitalizes on this mish mash of different personalities to the benefit of the final product. 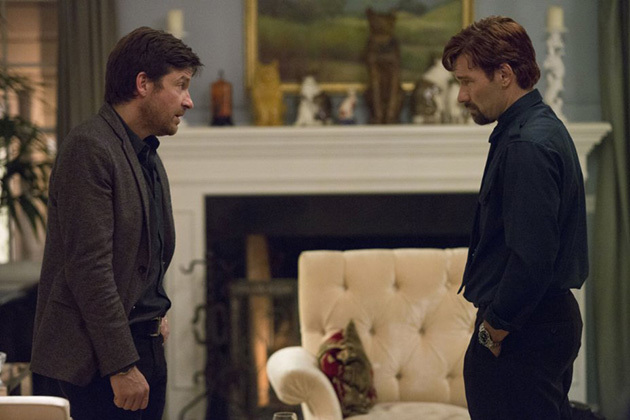 The Gift has quickly made Joel Edgerton a filmmaker to take note of. He takes well-known genre conventions and flips it for his own purposes. It is a bleak and harrowing journey, and some may see the end credits roll and question if it all really works as a whole piece. Let me tell you: it does work in the best way possible, and the more I think about it the better it gets. I know we still have a long way to go, but I can easily see this being one of the best films of the year. Also, be sure to check out our interview with writer/director/actor Joel Egerton.